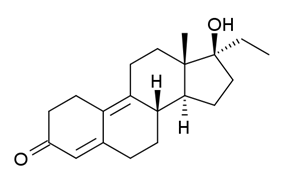 Ethyldienolone is a drug which acts as an anabolic steroid. It is slightly more active than methyltestosterone when given orally. ^ Edgren RA, Peterson DL, Jones RC, Nagra CL, Smith H, Hughes GA. Recent Progress in Hormone Research. 1966;22:305.